Mohibarts is about Art and Craft Tutorial. 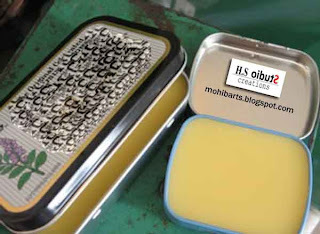 1.Choose a container or tin for your lip balm. You can use an empty Altoids tin (like the one above) or anything that will hold the balm. Just be sure to wash it in hot soapy water and let it dry completely. 2.Prepare your ingredients. The general rule is two parts oil to one part beeswax. You can use any oil that you like. Try adding almond oil for added moisture or peppermint oil for a fresh scent. 3.Melt the beeswax in a double boiler, ensuring that the top bowl does not touch the water. Once the wax melted, remove from the heat. Add your oils and as much lipstick as you want (the more lipstick you use, the darker the color will be). 4.Immediately pour the hot mixture into the desired tin. Let it cool overnight before using it on your lips. Make a Clock out of a Bicycle Brake Disc. Make bookends and hit a home run. Step on the GAS! Hit the Brakes! Humera ijaz. Awesome Inc. theme. Powered by Blogger.